Another guilt free recipe... This chicken dish is very easy to make and is super delicious! I just used the vegetables I had in the fridge and a tiny imagination. You can use the veggies of your choice. I am sure it will be equally tasty! 1) Cut all vegetables into thin strips; using 1 tbls of olive oil sauté vegetables in the order those are given to the ingredients. Do not overcook. 2) Cut the chicken into strips and season with the spices; cook it by using one tbsp of olive oil. 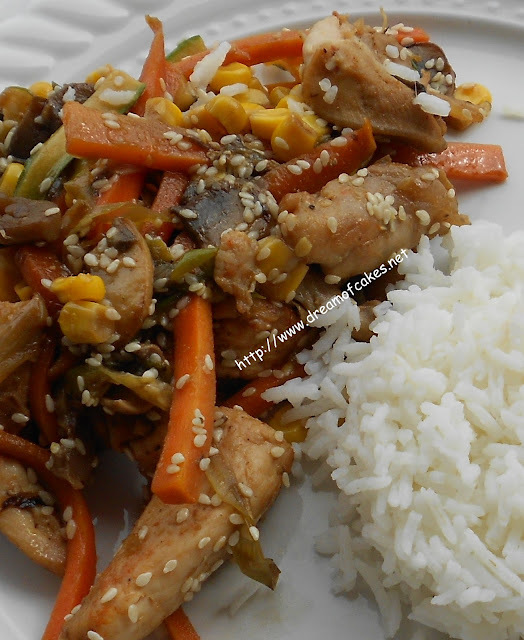 3) Combine chicken with vegetables; Add soya sauce and sesame seeds. This does look like a delicious well rounded meal! Also, I like the addition of the sesame seeds-the would add a nice nutty crunch. Thanks for sharing this tasty recipe! Hi Efty, your chicken dish look delicious and loves all the combination of the vege. This is a perfect 'raid the fridge' meal, nice finish with the soy and sesame. Looks great! Very simple & quick to make! Oh, this looks delicious! I love stir fries and chicken is one of my favorites! This is the perfect meal for my dinner...it looks very appetizing and light...I like it! This dish looks healthy and delish! Yummo Eftychia! I gotta try this!!! 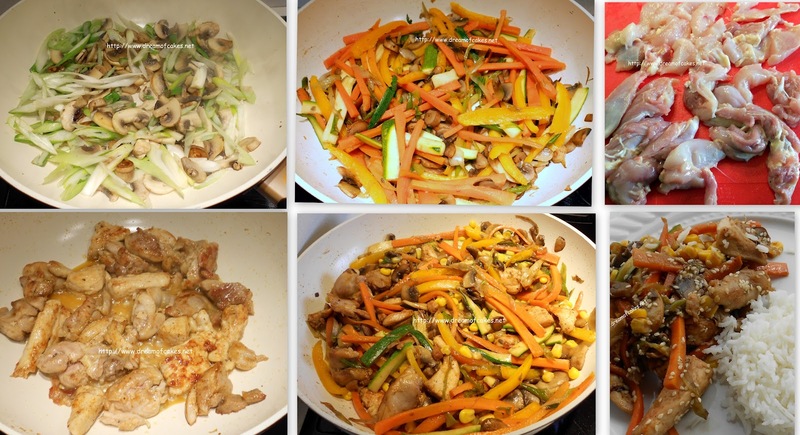 I love stir fry just like this one! Yum! this makes for a perfect mid week dinner E! Love it. Hey this looks delicious and easy to make. I am gonna try the recipe this weekend. Hope it looks as tasty as yours. That looks lovely! I love the sesame seeds! It was nice to see a dinner recipe here! This chicken dinner looks quick for those last minute weeknight dinners and I'm sure everyone would enjoy it. Our memories are filled with food from our childhood and how our parents/grandparents/etc. cooked for special occasions (and sometimes the regular days too) that as adults we look back and remember with such fondness that special meal. Our senses are so attuned to our memories, whether it is a fantastic family dish, a special scent such as your mother's perfume, or that special song. Recipes such as this can start new memories as well! Good food and good times for all! ~Michelle M.